April 15: Doğum günün kutlu olsun, Mimar Sinan! On this day in 1489 Mimar Sinan was born. After distinguishing himself as a military engineer with great skill by building fortifications and bridges, Sinan was appointed as head architect for the Ottoman Empire under Süleyman (r. 1520-66) in 1537, just as the Ottoman Empire had achieved significant status as a world power (even though they had held Constantinople/Istanbul since 1453). His position, similar to that of Surveyor of the King’s Works held by Christopher Wren a century later, placed him in control of all official building projects. He inherited a tradition going back to the reign of Mehmed, under whom artists and architects had synthesized a wide variety of source material into a distinct Ottoman style. Under Süleyman that style reached its zenith, just as the Empire itself reached widely across the territory now defined by Hungary to the Middle East and North Africa; his emblems flew over military vessels that controlled the Mediterranean, Red Sea, and Persian Gulf. Sinan’s position was more than court architect; he was the Imperial architect, raising the symbols of Ottoman power wherever Süleyman might build throughout the realm: designs for over 100 mosques, 64 madrassas and schools, 22 mausolea, 7 aqueducts, 46 hostels, 35 palaces and villas, 42 baths, and a bunch of tombs, chapels, and fountains all radiated from his office, where he oversaw an administrative structure numbering in the hundreds of architects, engineers, artists, builders and tradespeople of all sorts from the top of the pyramid. Even as his style was spread through the Empire, and copied down through the generations, his main monuments stand in and near the capital where they both honor and challenge the precedence of Hagia Sophia, the sixth-century cathedral built by Justinian as the central church of his Christian Empire. It had been turned to use as a mosque after the Ottoman invasion, and then became precedent for later builders–Sinan, most prominently among them, who was mesmerized by the appearance of a floating dome over its worship space. 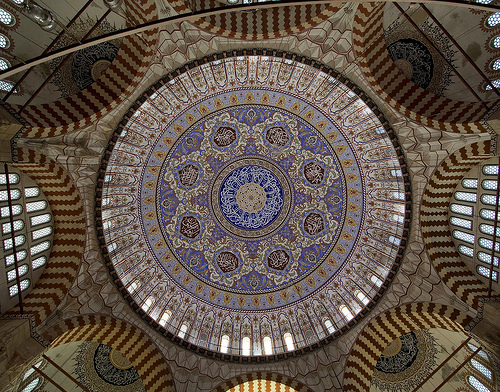 Of all Sinan’s works, he held the Selimiye Mosque in Edirne as his greatest work. It stands in the midst of a diverse collection of charitable buildings, including schools and a hospital. This contextual approach, and the basic design of the mosque that grows from the model of Hagia Sophia, are consistent in Sinan’s work. 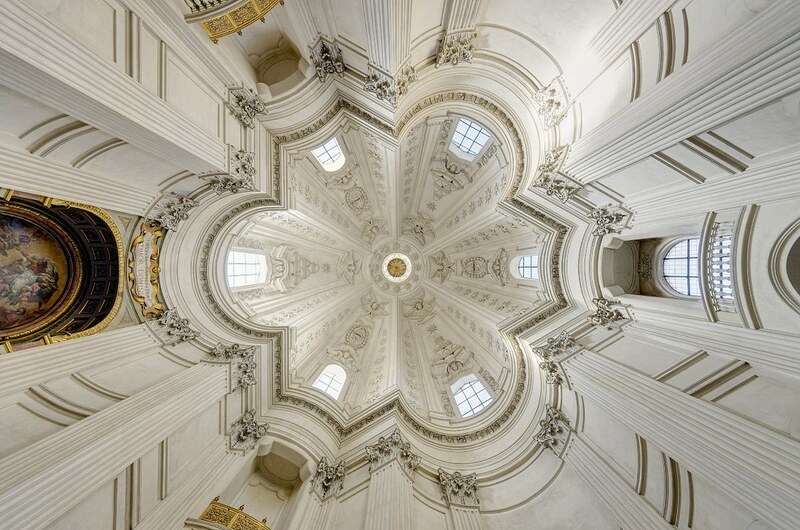 Here, the giant 102′-diameter central dome rises 140′ over a centralized plan; it is supported by arches and squinches that provide an octagonal structural support over eight piers that are sculpted to diminish their overall heft. While the exterior of the building is plain ashlar, the interior is frosted with colorful Iznik tile that reflects the copious amounts of light that enter in dozens of windows. THe overall effect is a light structure awash in light, billowing space in which the worship gatherings take place. Clio’s agents report that locals downplay Sinan’s achievements as being not as extraordinary as his mosques’ model, Hagia Sophia. Clio thinks it is a privileged aesthetic position indeed that fosters such attitudes, and further believes, that the aged beauty of an elegant lady does not diminish the loveliness of her daughters. On this day in 1258, Baghdad fell to the Mongols. The third of the Islamic Caliphates, the Abbasids established control in 752 at the capital of Baghdad (previously it had been in Syria), ousting the Umayyads from Persia, Arabia and North Africa–everywhere except al-Andalus, where they hung on for a few more centuries (more of them back here). Although they regained power in 1261, the Abbasids’ control had long been symbolic or significant in religious matters alone, having already ceded actual control to regional rulers in the tenth century. But the triumph of Hulagu Khan (grandson of Genghis) brought the Abbasid Caliphate to its end. 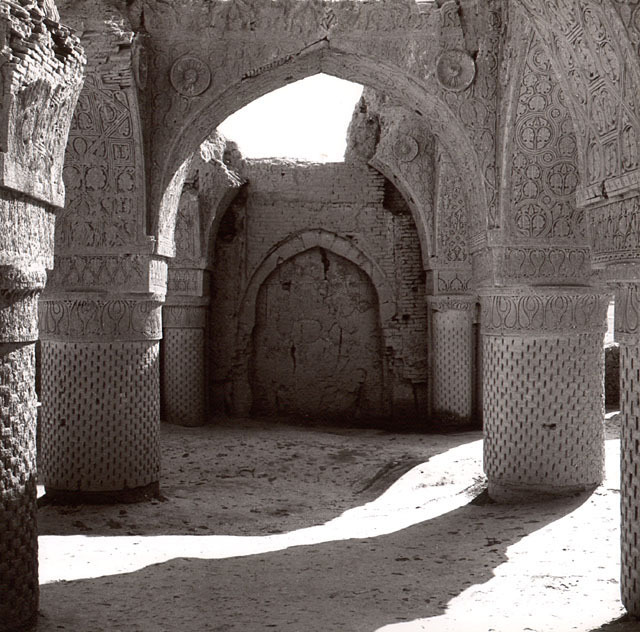 The roots of Umayyad architecture had grown from ancient Greek and Roman traditions; the Abbasids introduced a different sense of scale achieved by great mud- and baked-brick vaulted structures covered with decorative stucco work–materials that were available virtually everywhere Islam had spread its reach, which helped to establish a first “international style” for Islam. The Abbasids introduced a greater depth of eastern influence to their architecture, some of it dating back to Mesopotamia, mapped on to the hypostyle mosque plans established in the earliest days of Islam from Syria to Spain. 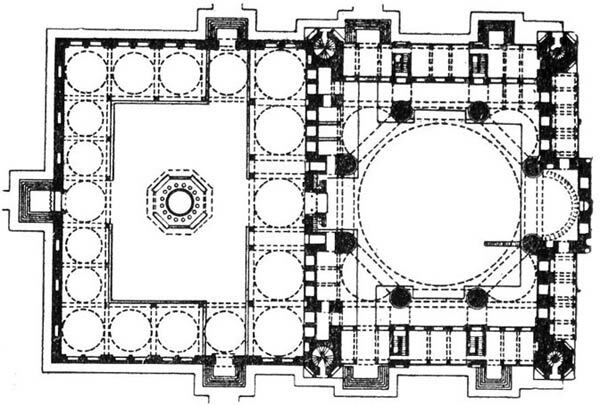 Regional differences are clear, but slight, within the first widely dispatched style of architecture representing Islam from its capital in Baghdad, as seen in the Great Mosque of al-Mutawakkil (Iraq), the Mosque of Ibn Tulun (Egypt), the Tarik Khane of Damghan (Iran), and the Masjid-I-Tarikh (Afghanistan). Due to the violently shifting sands of power in Baghdad from the thirteenth century to the present day, virtually nothing remains there of the Abbasids, whose monuments, often in a crumbling state, are scattered across their former territories from Tunisia to Afghanistan. On this day in 1571 Shah Abbas was born. Coming to power in 1587 at the age of 16, Abbas I of Persia (d. January 19, 1629) raised the Safavid Dynasty to its highest point of cultural attainment. 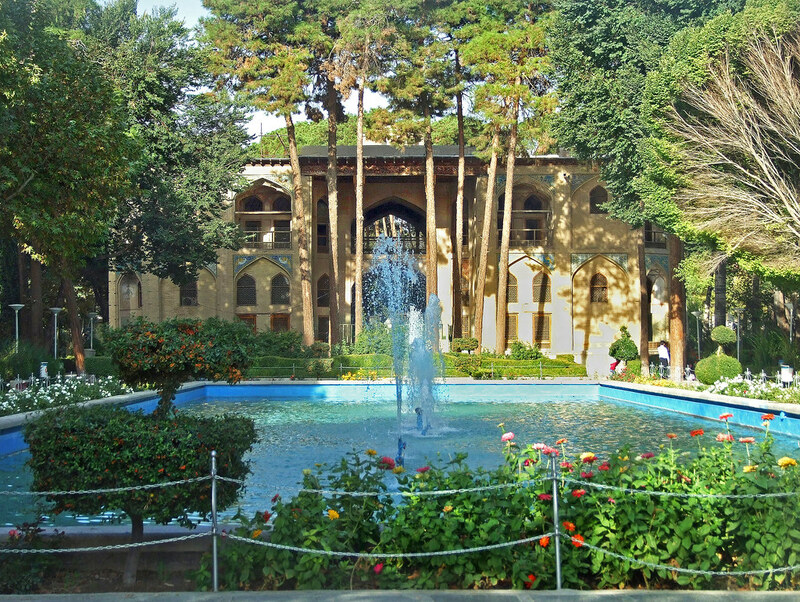 In 1598 he moved the seat of the sweeping empire to its central location in Isfahan. The complex he directed to exemplify his dynasty, constructed next to the existing ancient city, is one of the greatest of urban planning exercises of the period and a powerful symbol of Safavid rule and civic life. Unlike many similar contemporary projects in Europe, in which single buildings symbolize the power of crown or church, the expression here is an open space. The Maidan is defined by a two-tiered rectangular enclosure measuring 525 x 1667 feet, into which a series of great buildings open. 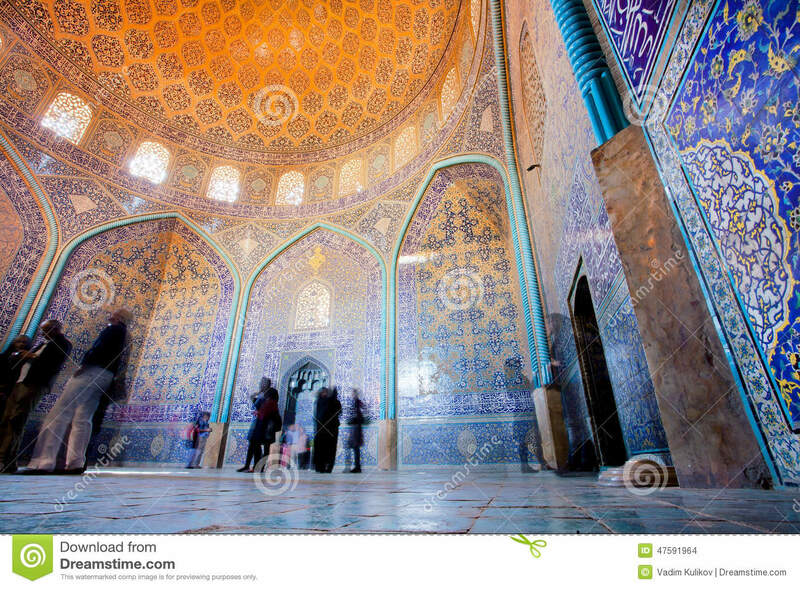 These include the Masjed-e Shah (Shah Mosque, from 1611) and Masjed-e Sheykh Lotfollah (Lotfallah Mosque, from 1603). The centerpieces of Persian Safavid architecture, they are built of vaulted iwans opening from flat rectangular portals that open into grand vaulted spaces topped with bulbous and pointed domes. Their relatively simple structural materials are covered with a veneer of brightly colored ceramic tile with a dazzling array of decorative motifs drawn from calligraphy and geometry with an effect that is equally brilliant and dazzling. 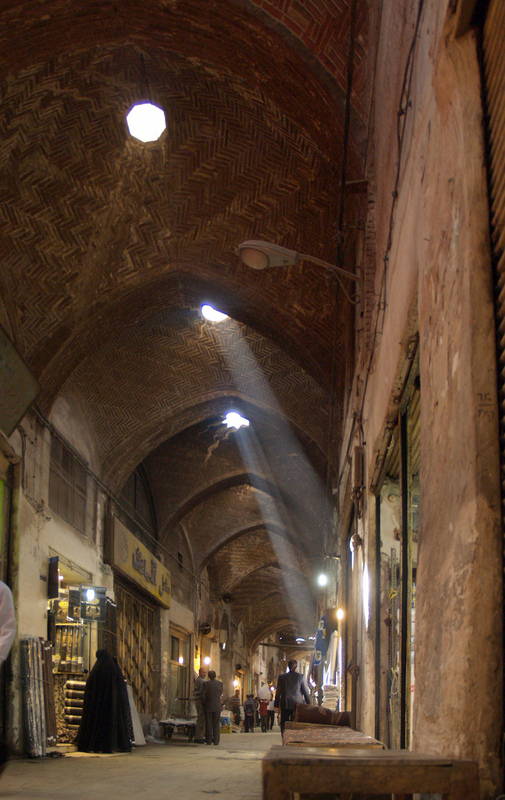 These main buildings, designed for religious use, are balanced by the palace (airy terraces in shady gardens) and bazaar (a complicated, dense warren of shops and other buildings that are top lit by small openings that allow limited sunlight to illuminate, rather than overheat, the interiors) that together express the essential arenas of public life. There are many squares in Ispahan, but of all, that which is called the Meidan is not only the loveliest; but I think, that of all regular Piazzas, it is the greatest and finest place in the world. A UNESCO World Heritage Site, the Maidan’s comprehensive quality reflected Abbas’ desire to have an expansive and orderly empire, which he achieved, to a certain extent. Abbas extended relations with Christians to secure greater ties with Europe–even sending emissaries to Rome to meet with Pope Clement VIII–, and established commercial relationships with England, helping to extend the routes of the East India Company. He was far less interested in working with his own family. An extreme worry of usurpation motivated his cruel murder or blinding of potential rivals. 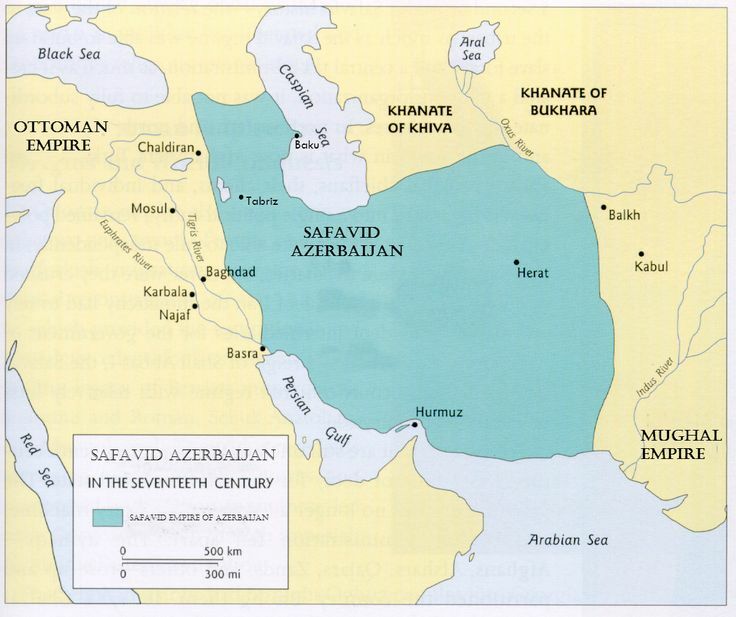 When he died, he left no heir, and a century later the Safavid Dynasty was at an end (official date 1722). But Abbas and his successors established important administrative, economic and religious legacies in Iran, with the Maidan as the physical symbol of the lost era. On this day in 1556 Humayun died. The second Mughal emperor, Humayun (b. 1508) died in the most admirable of accidental self-inflicted ways, reportedly tripping as he knelt in response to hearing the call to prayer–even though he was on a staircase with his arms full of books. 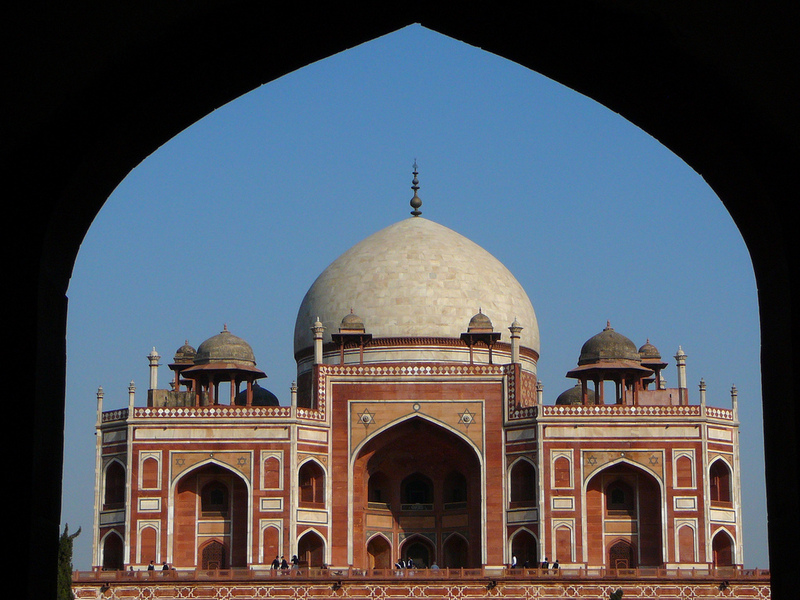 Devout in religion, assiduous in his studies, Humayun was an important force in the development of Mughal architecture. As the empire spread (ultimately) to cover contemporary India, Pakistan, Bangladesh and Afghanistan, it also synthesized a great variety of aesthetic influences: Persian, Muslim, Indian and other traditions blended into a manner of building noted for strong prismatic volumes with chamfered corners, ogee-arched openings in flat screens, panel-like treatment of surfaces bordered by contrasting materials, broad flat and curved planes marked off by delicate projecting relief sculpture and glittering inlays; all of it surmounted by squat chhatri pavilions and bulbous, slightly pointed domes. The tomb of Humayun in Delhi (1562, above) is the first signature monument of Mughal architecture. The monument, and the man, set the tone for generations of art and architecture that ornamented and celebrated the empire: Humayun’s son, Akbar, expanded the empire and followed in his father’s artistic footsteps, directing the compilation of the brilliant Akbarnāma; Akbar’s son Jahangir became a great connoisseur and collected both Muslim and Christian art (during the period in the west known as the Renaissance); Jahangir’s son Shah Jahan would build one of the most famous buildings of Islam and India. If you don’t know what that is, stay tuned! On this day in 1492, Boabdil (ca. 1460-ca. 1533) surrendered Granada to Los Reyes Católicos, quite literally handing over the Alhambra’s keys to Isabella and Ferdinand. The Catholic Monarchs had made a point of concluding the Reconquista that had been started centuries before them, to “reconquer” the Iberian peninsula for Christianity. (Clio wonders what the Romans of Hispania, the Phoenicians who founded the beach town of Cadiz, the Iron Age Celtiberians, or Neolithic Iberians would think about that.) After making many promises about sustaining religious toleration that had been prevalent throughout al-Andalus, they soon reneged, demanding conversions and/or forcing Muslims and Jews out of Spain. 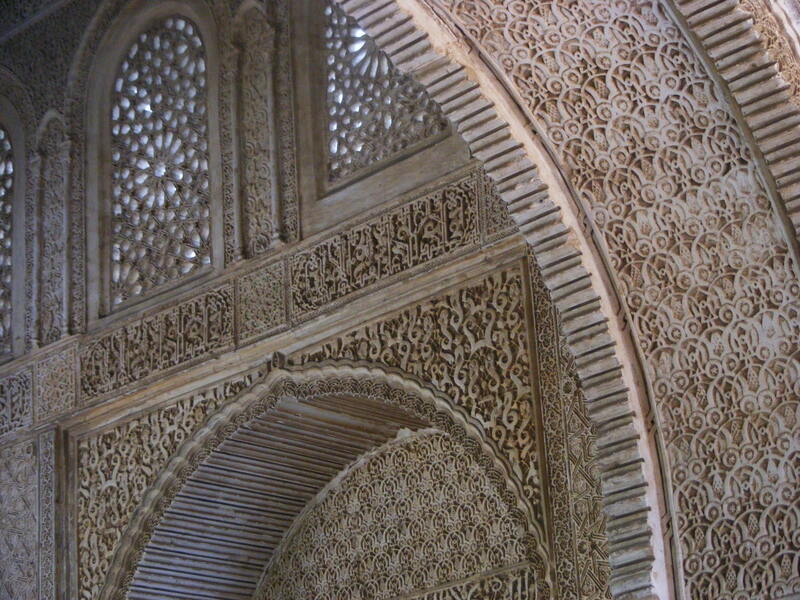 Five centuries later, the Alhambra is the most-visited site in Spain. Even in its reduced state (somewhat the worse for wear, shorn of its gardens) it is the glorious monument to Nasrid design. In 1527 Charles V directed the construction of a ponderous palazzo in the center of the complex. Today, when the Alhambra is brilliantly illuminated at night, the Catholic monarch’s pile is left in shadow. For three years MoT’s apparently extensive, virtually worldwide, and expertly comprehensive staff has peered into the most pressing matters of architectural practice, education and design, critiqued buildings, museums and exhibits, sneered at Barbiexplotation, celebrated fine films and good dogs, prepared lavish meals for dead architects, fawned over nineteenth-century designers, and basically kept an eye out for people, events and activities that fulfill the essential standards of the social contract known as taste, and skewered those that fail. 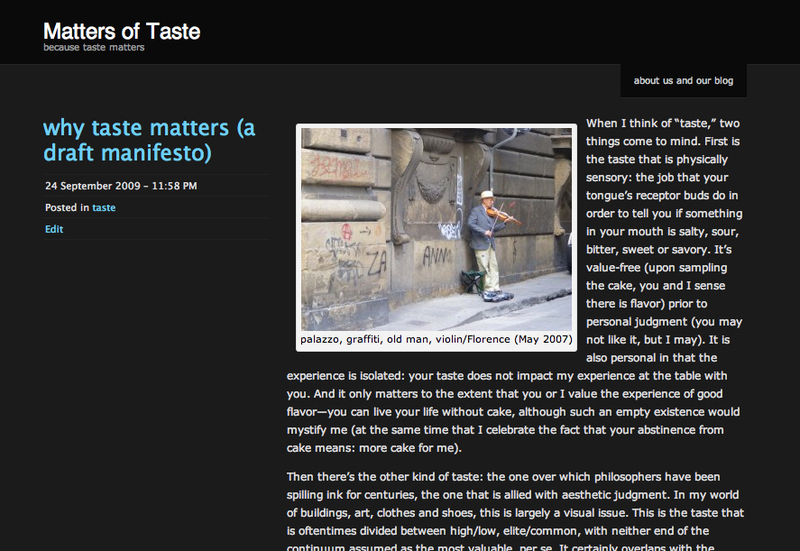 Vive la Taste. You are currently browsing the Islamic Architecture category at Clio’s Calendar: Daily Musings on Architectural History.